The Atelier disposes upon unique original antique frames which includes a small but important selection of Italian frames from the 15th to the 18th century. 3. gilded profileframe with incised leafs, 18th cent. 4. ITALIAN Salvator-Rosa frame, XVIII cent. 6. ebonised and parcel gilt cassetta frame with floral and leaf scrolls, Tuscany, 16th cent. 13. simple moulded profile frame, 18th cent. 14.brown cassetta frame with floreal and leaf scrolls, Tuscany, 17th cent. 15. simple Salvator-Rosa frame, Rome, 18th cent., gold leaf 16. coloured cassetta frame with gilded inner and outer mouldings, Genua, 17th. cent. 17. gilded profile frame, Italy, 18th cent. 18. Rococò frame con carved floreal ornaments, Italy, gold leaf 19. Profile frame with carved leafs, Italy, 17th cent., gold leaf 20. gilded and carved cassetta frame, emilia, 17th cent. 21. neoclassical profile frame, French, 19th cent., gold leaf 22. gilded profile frame with carved inner and outer moulding, 17th cent. 23. couple of black profile frames with gilded carved leafs in the corners, Rome, 17th cent. 25. couple of gilded profile frames with carved leafs in the corners, Italy, 18th cent. 26. marmorized profile frame with slightly carved and gilded leafs in the corners, Marche, 18th cent. 27. 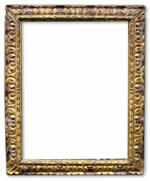 Rococò frame with carved leafs in the corners, gold leaf 28. ITALIAN XVII cent. 29. floreal profile frame gilded/coloured, Naples, 17th cent. 30. couple of marmorized profile frame with incised gilded angles, 18th cent.